This week, “What Are Little Girls Made Of?” was filming. 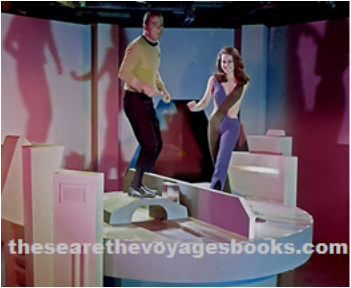 The playful behind-the-scenes picture you see was actually taken at the end of filming, and William Shatner and Sherri Jackson had much to dance and celebrate about. It had been a long and difficult one, taking eight full days spread over nine (It began mid day on July 28 and wrapped mid day on August 9, 1966), and it was finally over! “Little Girls” was also one of the most expensive first season episodes to make, costing $211,061, which would be like 1.6 million dollars today. And that was way over what Desilu and NBC wanted to pay for Star Trek episodes. So why did it take so long to film and cost so much to complete? There were many reasons “Little Girls” was such an expensive and time consuming production. The censorship person was also there because William Shatner had to lie on the spinning wheel, naked (with only his groin area concerned by a metal strap). And network censors on the set always slow down the filming. And, finally, there was the split screen process needed to have two Kirks appear together in the same shot. Note the picture above, of Shatner sitting at the table looking toward his stunt double. After the scene was covered from this angle, and with the camera “tied down” so it wouldn’t jiggle, Shatner and his double trading places, and then the scene was shot again. And that took up valuable time. The two versions would then be combined together during post production. And that cost extra money. Read all about the writing (with memos exchanged between Gene Roddenberry, his staff and NBC), and the making (with broadcast schedules, production notes, and first hand recollections from those who were there), and the first broadcast (including the Nielson ratings) of this episode, and all the others from Star Trek’s first season, in the Saturn Award winning book, These Are the Voyage – Star Trek: TOS [The Original Series]: Season One, on sale now. Get it for less here than anywhere else, and autographed by author Marc Cushman!